We need your support to create a fantastic Graduation Night Party for our Seniors this coming year. Every year the Graduation Night Committee of the Wilson High School PTA holds an all night event to offer a drug and alcohol free venue for seniors to celebrate this significant event in their lives. This safe and supervised environment affords students a final opportunity to enjoy each other's company and acknowledge their accomplishments before embarking on their respective pursuits. This program is in the fourth decade of existence and has proven to be a proactive tool to reduce risk often associated with graduation celebrations. There are over 307 potential attendees for this year’s celebration. We offer scholarships to those who can’t afford to pay the ticket cost. One goal of the event is to have every Senior attend the event, whether they can afford it or not. 40-60 parent volunteers are involved in the planning, fundraising and running the event. The celebration will take place on June 10, 2015 at an undisclosed facility, reserved a year ahead of time. Your donation can be used to offset expenses. We are charging $110 per ticket this year. This will help to cover major expenses of the event; the rest will be covered by fundraisers, donations and grants. HOW YOU CAN HELP - Grants/Donations: If you have a business or organization, you could give a grant or cash donation to the event. We can also accept private cash donations. Deadline: April, 2015, but would prefer earlier contact. Contact person for Grants and donations is Leslie Baird: lesliemilnebaird@gmail.com. For more info about the event: http://www.pps.k12.or.us/schools/wilson/927.htm. Thanks for your enduring support! School funding has improved in Oregon, and PPS this fall benefitted from unexpect- ed revenues of over $16 million. Sounds good (and it is) but keep in mind that over the past 15 years funding has declined so steeply that Oregon is now well below national average in per-student spending. Although school funding has improved slightly and the economy is in recovery, Oregon is still behind the curve in funding a quality education for our children. The Wilson Foundation raises money to pay for additional teachers at Wilson. Do you value a breadth of elective offerings and reasonable class sizes? Do you value a strong high school in our community that engages students and prepares them to be successful after graduation? Then please make a contribution to the Wilson Foundation. We rely on our community to bridge the gap between adequate and excellent. Thanks to your support in past years we have been able to add elective courses, reducing class size and increasing choices for students, keeping them in school and engaged. Back after several years’ absence are Wood and Metal Shop and Market- ing. New courses this year include Sound Engineering, Video Engineering, Dance, Yoga, and Latin. Help us keep up the momentum! Two Wilson families have generously pledged donations of $500 each to kick off this fundraising campaign. Help us turn this into an amount that will really make a difference at Wilson High School. If you haven’t given yet this year, please consider that your donations make a direct impact on the quality of education available to our students and give generously. Please now consider whether your budget can accommodate an additional contribution, perhaps on a monthly basis. Foundation funding impacts every student in the school. Please support Foundation today. Follow this link for more details: http://www.pps.k12.or.us/schools/wilson/files/school-wilson/2014_direct_appeal.pdf. Wilson Alum: Have you misplaced your yearbook? The school has yearbooks from prior years available at Wilson. Yearbooks available from 1980s, 1990s, and 2000s. Contact Erica Meyers at: emeyers@pps.net to inquire. 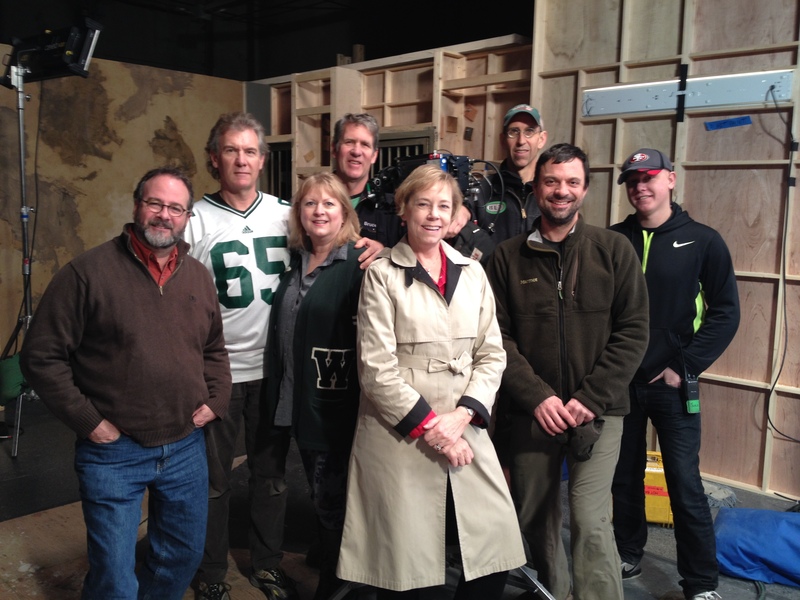 WILSON GRADS WORKING ON SET OF "GRIMM"
KC Cowan '75, writer, journalist, producer is doing a story on the Wilson High grads working on the set of Grimm, the NBC hit television show. Her article specifically on the Lawson brothers will be in the January 2015 issue of The Southwest Portland Post. Here is KC posing with the Wilson grads: Backrow L - R: Sean Kennedy '78, Brian Lawson '79, Maureen Berrie-Lawson '78, Bruce Lawson '77, Brent Lawson '79, Jesse Bellis '07. Front Row, KC Cowan '75, Tyler Stephens '88. John Carhart is an architect who has been involved with the design of many remarkable buildings in Chicago, New York, Portland and Los Angeles since graduating from Wilson in 1986 and the University of Oregon School of Architecture in 1992. While at Wilson, John played soccer. Most recently John was the Lead Designer of the new Health Sciences Biomedical Research Building at the University of California at San Diego. This is considered one of the most innovative and advanced scientific research facilities in the United States. Currently, John is a Partner at an architecture firm in Santa Monica called Foundation Architecture. John's years at Wilson were very memorable. One of John's favorite teachers was Mr. Stensrud who taught geometry during his sophomore year. John says, "This class was my favorite because it was the kind of math that I could visualize clearly and have fun with. At that time I had already made up my mind to pursue architecture so I knew that geometry was something that would be useful to me in my career. And it certainly was." John also enjoyed the art classes that he took with Mr. Pillegi. "He was very knowledgable and passionate about art and it was an inspiration to me," John recalls. "Mr. Ladd was also a teacher who opened my eyes to great books and the pleasure of reading and learning," he adds. When asked for advice to current students at Wilson, John says, "Read as much as you can and develop your writing and speaking skills. The people who can express themselves well will always succeed in their careers and personal lives. Communication skills are very important now and will always be." After Wilson, Natalie Goff (Schumacher)'88, attended school in California for several years. She returned to Portland and graduated from George Fox with a teaching degree. Natalie taught at the junior high level at West Hills Christian School in Portland for five years. She then moved to Germany and taught at an International school. During that time Natalie was a teacher and middle school administrator. In 2006, she returned to the United States, and back to West Hills Christian School where she taught 5th grade. Natalie completed her Masters in Education and moved into administration. In 2013, she wrapped up her job, got married in July, and headed to Nicaragua with my new husband. Natalie currently lives in Granada, Nicaragua and works with a company called Puralytics. She and her husband (Stephen Goff) started a non-profit, providing clean drinking water for the people of Nicaragua. Natalie says, "We have an opportunity to get to know these friendly generous people, and provide them with something they need." Check out their website at: N-response2.org if you would like to know more. Natalie told us that Mr. Penk was an influential teacher at Wilson. She says, "He related well to the students and did a great job building the groundwork for us to make informed decisions, both in science and in life choices. I met up with him about six years ago, and he was playing the fiddle at a contra dance. He has a lot more gray hair, but his kindness and interest in others was still very much a part of his character." For words of wisdom for current Wilson students, Natalie says, "Follow the two greatest commandments - if you don't know what they are, Google them!" Ashley Swafford graduated from Wilson in 2005, where she took three years of photography classes. Taking time off after high school, she started working at Ritz Camera in Portland. "I thought it would be a great way to transition from dark room to digital and possibly meet photographers in town," says Ashley. It worked, not only did she gain invaluable experience she met a wedding photographer, Laura Sonnenberg, who hired Ashley to be her "second shooter" for weddings. When Ritz Camera closed in 2009, Ashley decided to pursue a career in photography. She was accepted to the Art Institute of Portland and graduated in 2013 with a Bachelors of Fine Arts degree in Photography and Design. Ashley says, "it was the biggest challenge I have ever faced, but I got through it." Today, Ashley has her own business called "Ashley Swafford Photography". You can find out more about her work at: www.ashleyswafford.com. She works freelance, shooting everything from families, seniors, children, model portfolios and food. In fact, she recently worked with the Wilson Class of 1964 taking photographs for their 50th reunion in 2014. When asked about her time at Wilson, Ashley reflects that Susan Kennedy Parker was the most influential person that started her journey into photography. "I really do owe my career choice to her," says Ashley. "She opened a whole new world to me by looking through a camera. She taught me abut seeing 'photographically' and how objects seen through a lens can actually seem quite different than seen with the naked eye." Ashley says her advice to current students is that it's never to late to really find out what you want to do in life. She states, "Don't let anyone pressure you into making a decision that huge until you figure out that it's something you really want. The last thing you want to do is spend 4 years in college completing a degree that you were pressured into doing. There is no shame in waiting! But when you do figure it out, just go for it!" On November 6, 2014 Hillsdale resident and Wilson alumni parent Don Baack was presented the Sandy Diedrich Environmental Stewardship Award at the 30th annual Spirit of Portland awards ceremony. Don is the founder and president of SWTrails PDX, aka SW Trails, a nonprofit organization and community group that promotes walking and biking in Southwest Portland. Don and Gaile Baack are the parents of Eric '85 and Kristin '87. SW Trails sponsors a walk every second Saturday of the month at 9 a.m. at the west entrance to Wilson High School, 1151 SW Vermont Ave., and meets monthly, generally on the fourth Thursday of the month, at 7:00pm at The Watershed At Hillsdale, 6388 SW Capitol Highway, to discuss walking and biking in Southwest Portland. For more information on SW Trails or to join, sign up for the mailing list or become a sponsor, visit http://swtrails.org. Follow this link to read more about Don's achievements: http://portlandtribune.com/scc/103-news/242238-106151-baack-on-the-trail. Mike Clopton is retiring as Wilson High baseball coach after more than a half-century in coaching. According to an article in the Portland Tribune, Clopton had a four-decade run at Wilson and Jackson highs, where his teams won state championships in 2006 and 2012. He has spent 51 years in coaching baseball in Portland. Among his many honors over the years was a national high school coach of the year award. Clopton's successor with the Trojans will be Jeremy Shetler, one of his longtime assistant coaches. Jeremy is a dean and teacher at Wilson. "Coach Clopton created a culture where alumni players realized what a great experience they had and have given back with their time and money,” says Shetler. “Over 50 former players have coached in the Wilson baseball program at some level, either school ball or summer ball." Well done, Coach Clopton! Congratulations, Jeremy! To read the article with photo go to: http://pamplinmedia.com/pt/12-sports/239219-105727-mike-clopton-retires-as-wilson-baseball-coach. Here’s another earlier article from the Portland Tribune about Mike: http://portlandtribune.com/pt/12-sports/135194-wilson-high-christens-clopton-field. Nancy (Bleyhl) Smethurst and Tom Smethurst both class of 1975 wonder if there is a 40th reunion in the works for 2015. They have been married 33 years and live in Bakersfield, California. Class of 75 not young, but always young at heart! BART BROWN '66 WHERE ARE YOU? The WWHS '65 Reunion Committee is looking for any information or copies of obituaries of our classmates who have passed away. If you have any information, please contact Lynn Eaton (Lynette Kuns) or 503-682-3588. Thank you! "Save the Date WWHS Class of 1965" for the 50th Reunion to be held on Friday, August 14, 2015 at the Tualatin Country Club. If you haven't received an email or a postcard from Reunions With Class, please go to their website -http://reunionswithclass.com - ask for your classmate code and register your contact information. Also, keep updated on our class Face Book page at Woodrow Wilson HS Class of '65 - PDX. Information will be posted as it becomes available. Plans are in the works for your upcoming reunion. If you would like to participate in the planning, please contact Richard Caldwell '75.